When you went ashore on particular islands you stood a chance of meeting some real local characters. 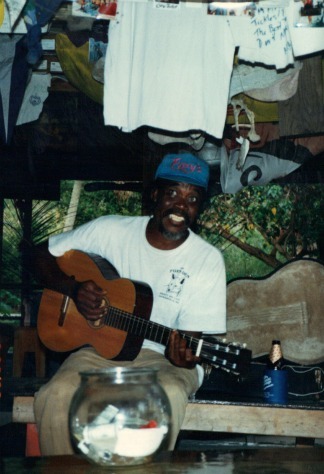 This is Foxy Callwood, of Foxy's fame, from the island of Jost Van Dyke in the British Virgin Islands... I have lost track of the hours I have spent listening to the same songs and stories on the sand floor of his bar/restaurant. It is said if you cannot be in Times Square in New York City, or Trafalgar Square in London, try to be at Foxy's for New Year's Eve...I have never had the nerve or desire to do so...but I hear it is quite the place. Jost Van Dyke has a population of a little over 200...there were no paved roads when I last visited and I hope it's the same today. 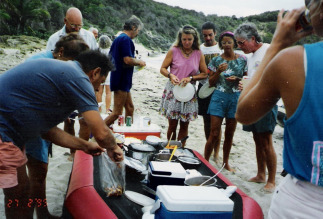 Here is a picture of a potluck on a beach on St. Bart's... as I recall my wife and I did not know a soul when we anchored one afternoon. A dinghy pulled up to our boat and announced the potluck dinner that was going to be conducted that evening... we made lifelong friends, and discovered that sailboat cruisers tend to stick together for outings. Many a meal or cocktail will be shared in another boat's cockpit. If we wanted to splurge two or three couples would get together and rent a taxi for the day and tour the island... We did this in Nevis, St. Kitts, Dominica, among other islands. It was always comforting to know that there was usually someone you could call upon when a particular maintenance problem arose on your vessel. 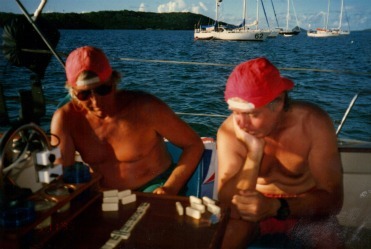 Every island seemed to either have a fellow cruiser or a cruiser that would know how to locate any particular skill that you needed...I had welding done in Antigua, sail repair in the Bahamas, and beautiful and cheap teak wood working in Trinidad. The sailboat cruising community was a tight one, and I found that to be very comforting in our eight years living aboard a sailboat. It usually took no more than a simple call over the VHF radio to find out where the nearest grocery store and cheapest and coldest beer was on any island. Of course sailboat cruisers had to stay mentally sharp... or at least try to stay mentally sharp. Thanks for reading about sailboat cruisers they were a fun lot.